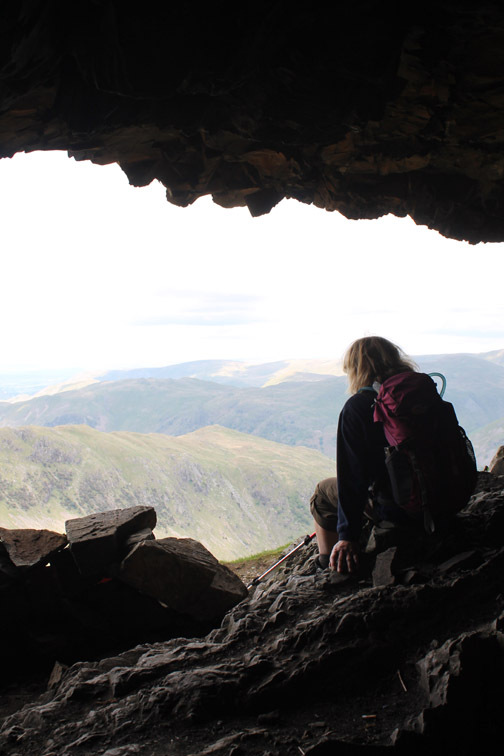 " Hart Crag and The Priest Hole "
Date & start time: Wednesday 5th June 2013, 11 am start. 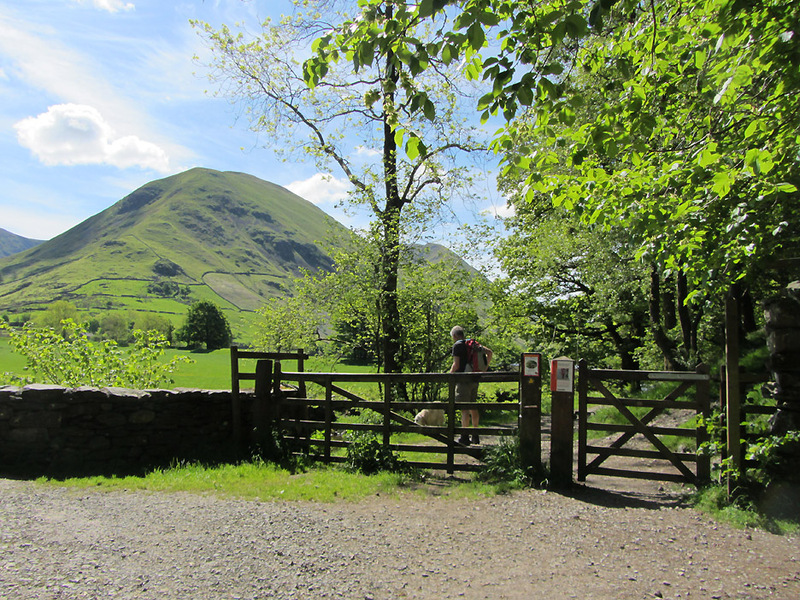 Places visited : Hartsop above How, Hart Crag, The Priest Hole, Dovedale, Brothers Water. 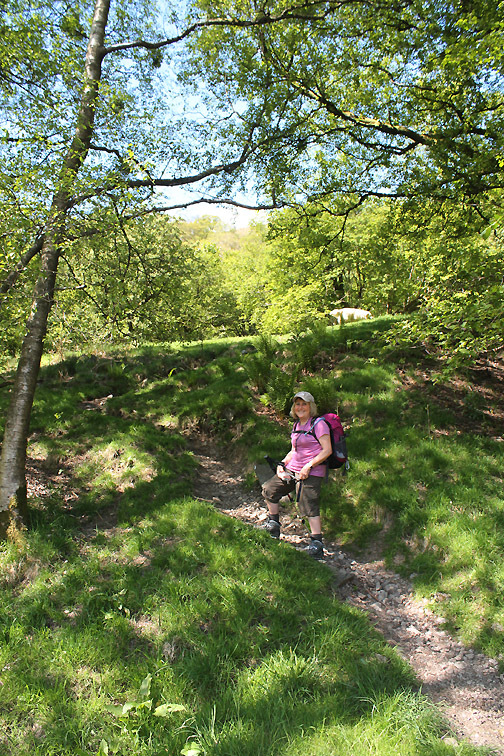 Walk details : 6.75 mls, 2500 ft of ascent, 6 hours 30 mins. Weather : Sunshine and fair weather clouds. 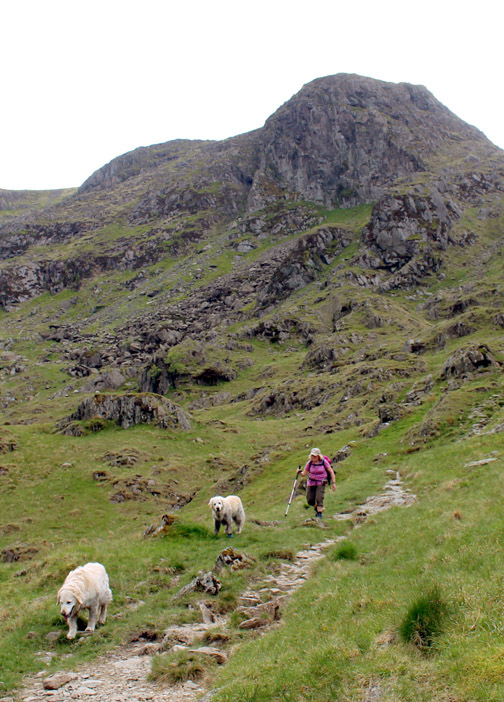 Bethan and I last walked Hart Crag in a rain storm, in the half-light of a wet September morning in 2010. 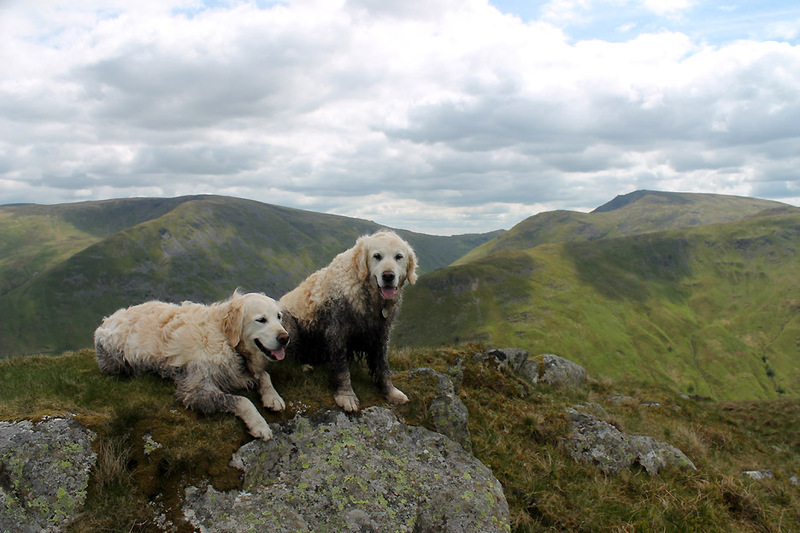 Neither Ann nor Harry have walked it since 2006 . . .
so we all head upward, to pick another fell from our list of third round Wainwright tops. The bridge at Cow Bridge . 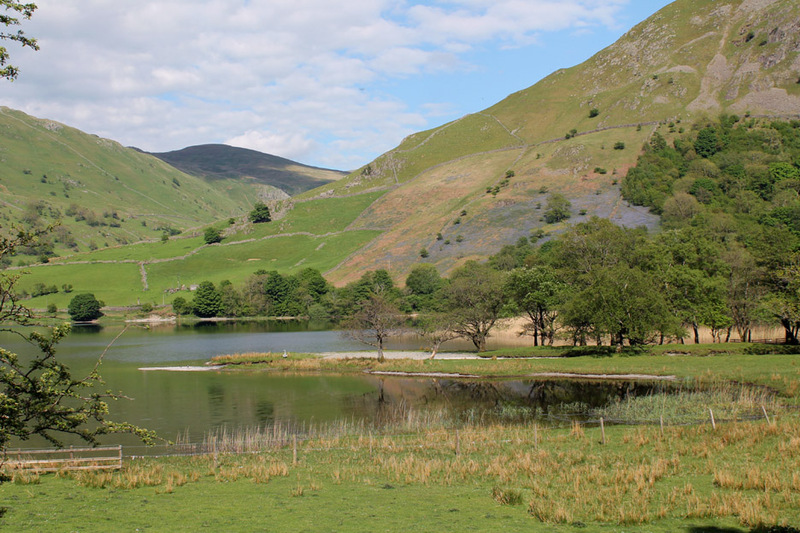 . . looking across to Hartsop at the start of the walk. Through the gate but immediately right . 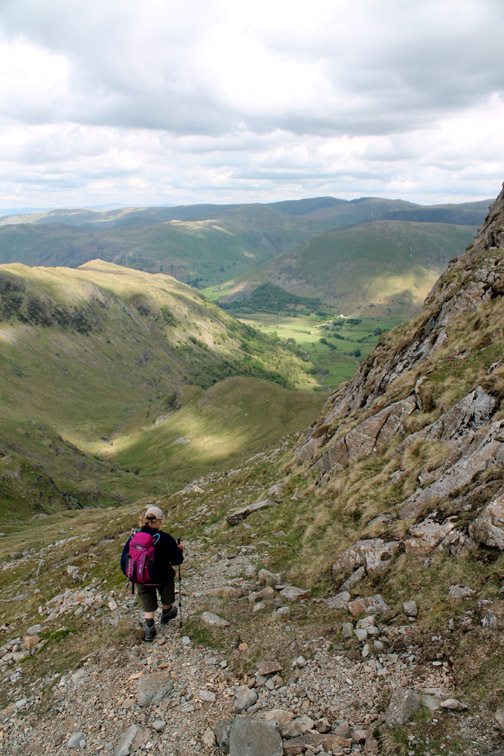 . . up the steep side of Hartsop above How. No chance of a quiet walk in or any warm up time today. 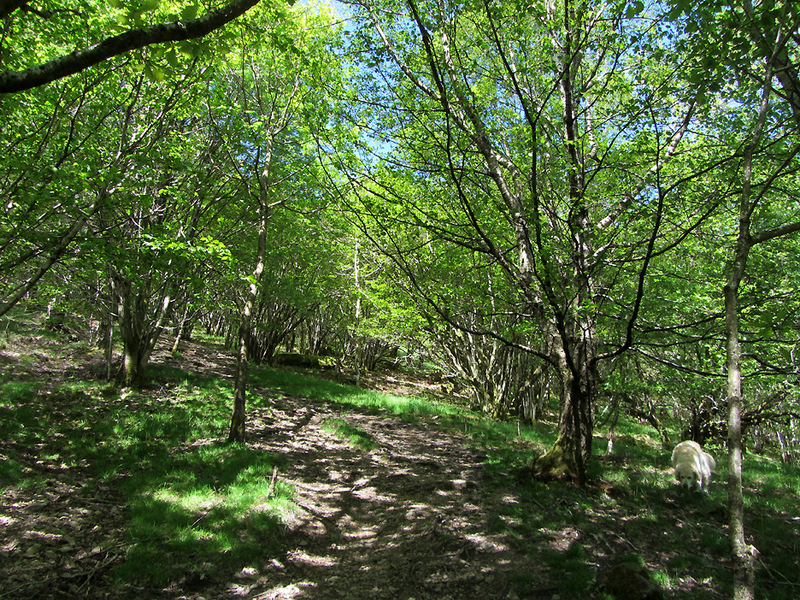 A lovely dappled beech and birch wood to take your mind of the angle of ascent. Happy to be out on this fine day. 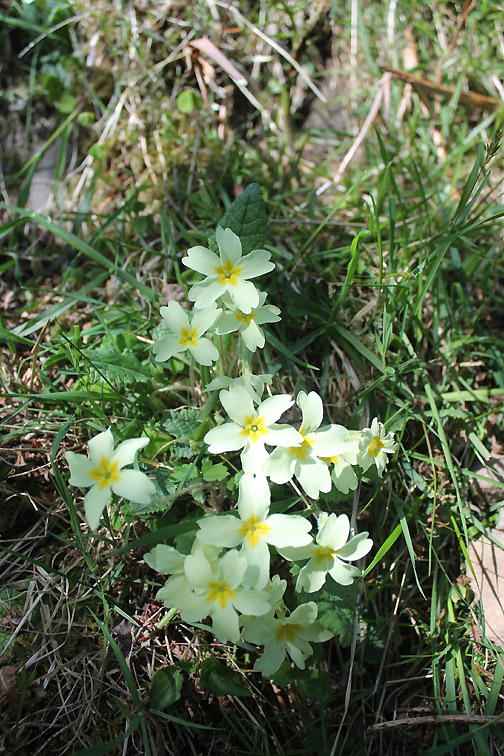 Woodland Primroses by the side of the path. 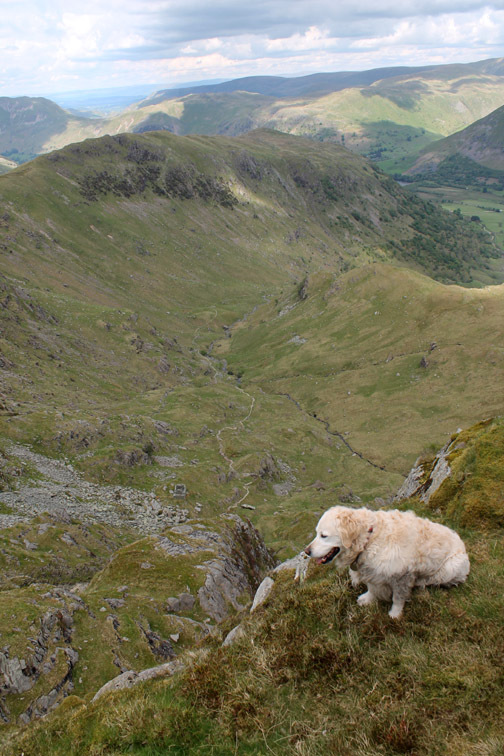 Bethan stops to take in the view . 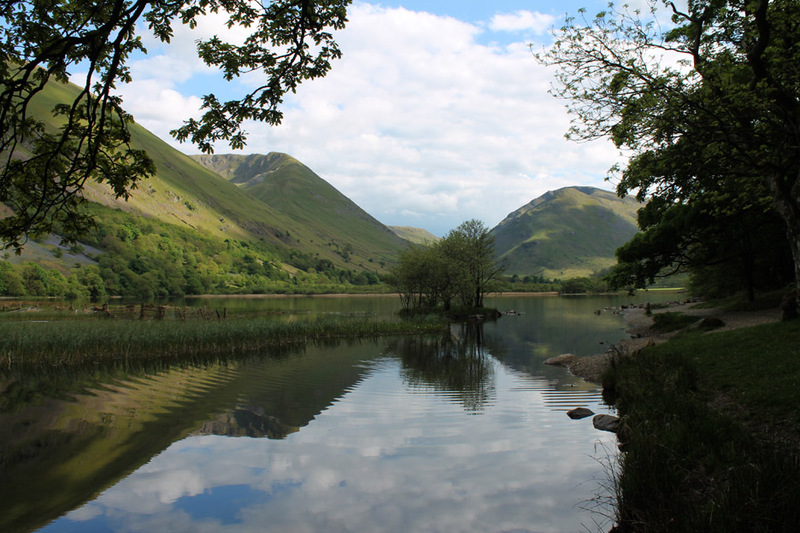 . .
As we climb on the sunshine sparkles on the surface of Brothers Water below us. 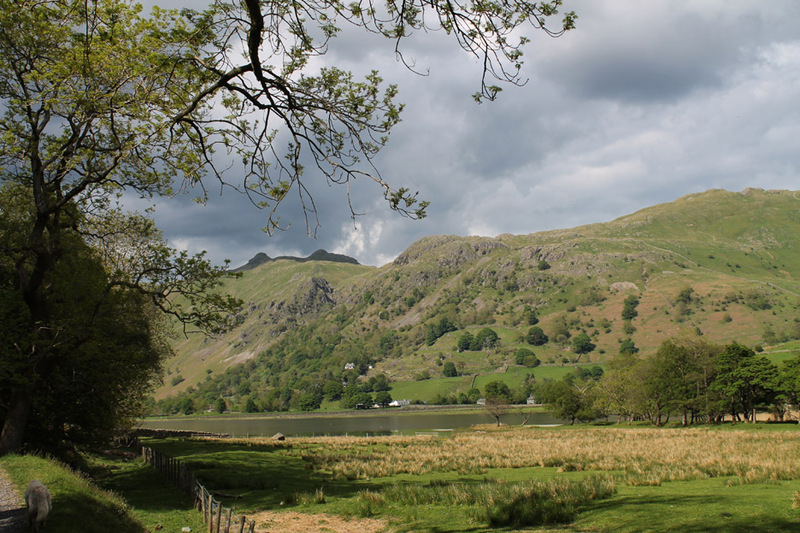 one of the stopping off places when we set off to climb the High Street fells. 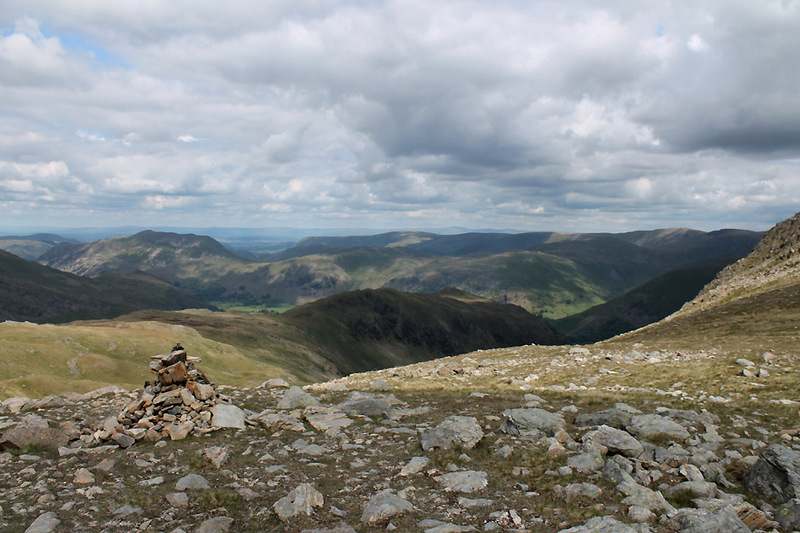 Place Fell dominates the distant view beyond the "Great Wall of Hartsop above How". Navigation is easy now as we follow the wall. 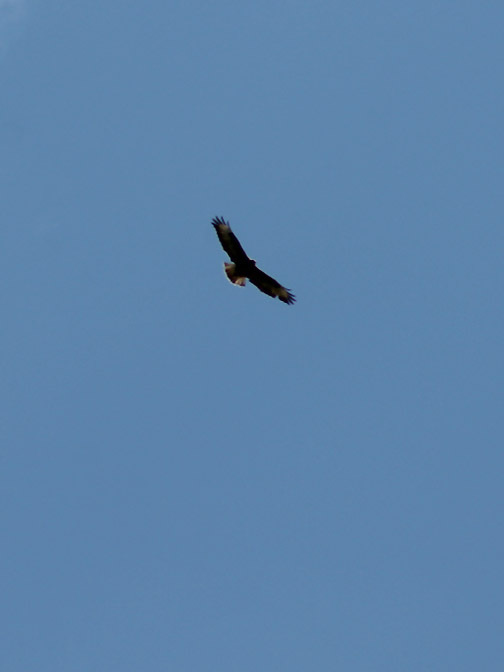 High above a Buzzard circles upward in the thermals. 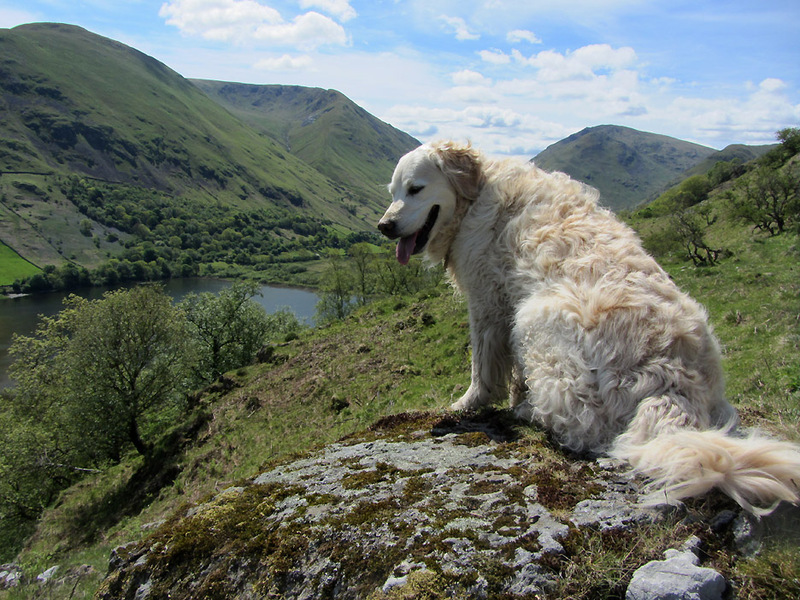 Is that the summit ahead ? 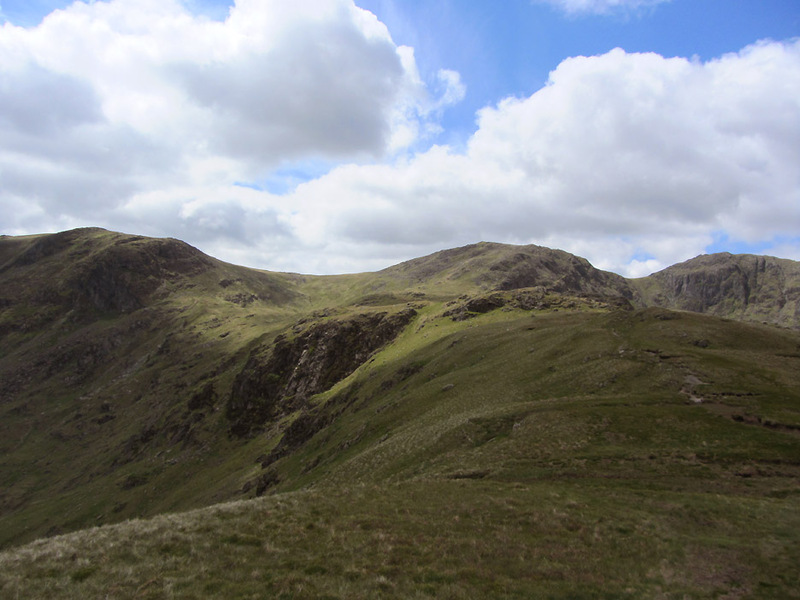 Hartsop above How has several false summits before we reach the highest point of the ridge. Harry and Bethan find a rather peaty pool in which to relax. Half golden / half chocolate retrievers now . . . tell me something new ! 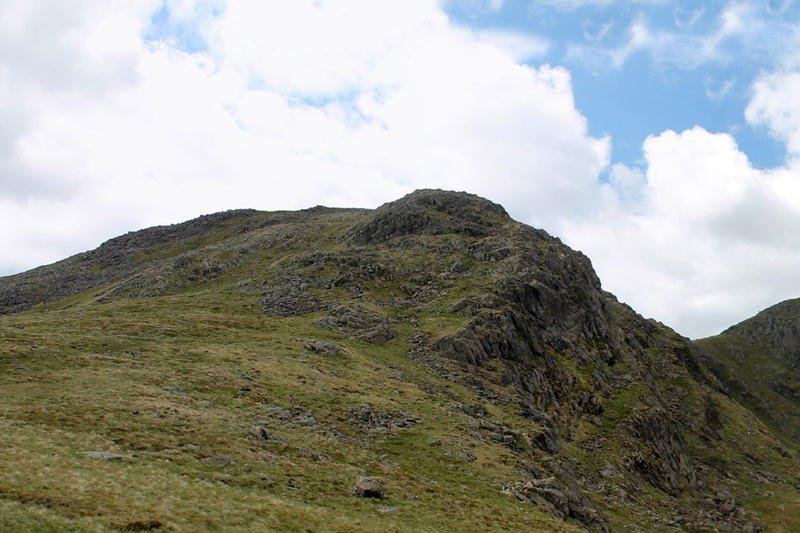 Ahead is the true summit of this elongated fell . 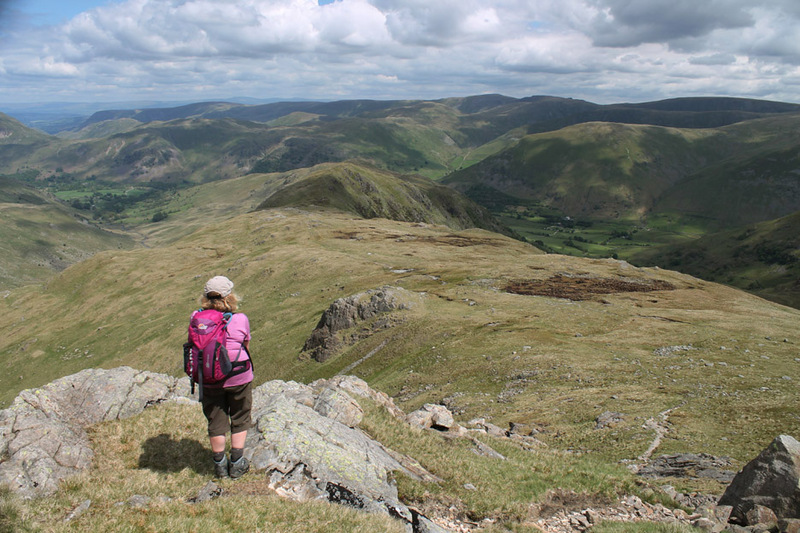 . .
set against the backdrop of the Hart Crag and Fairfield massif. Onward now . 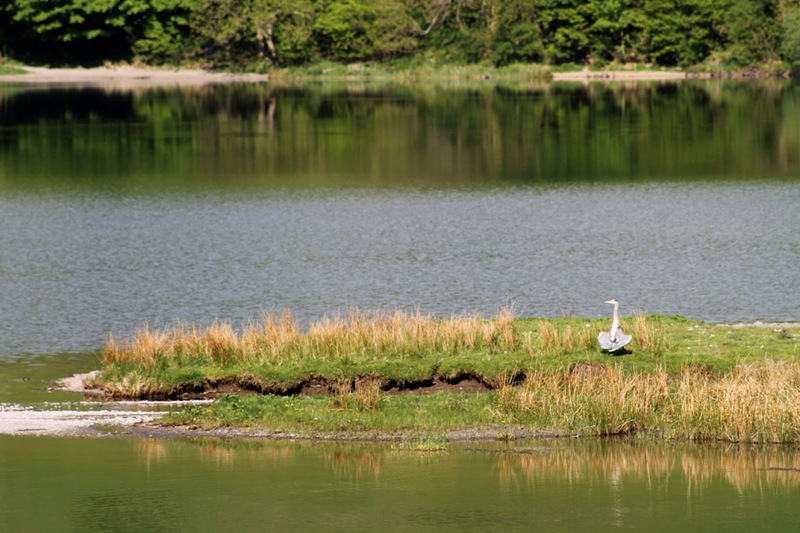 . . it was about here that I dropped my camera's telephoto lens and didn't realise for about ten minutes. Don't look for it if you're up there . . . at that price I went back straight away and found it, fortunately undamaged ! Back with Ann now . 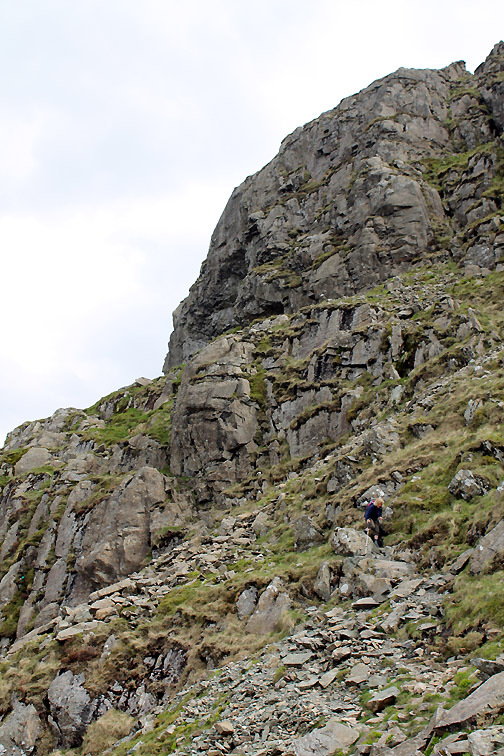 . . and we set off to tackle the last part of the climb up onto Hart Crag. Always time to stop and look around on a day like today. 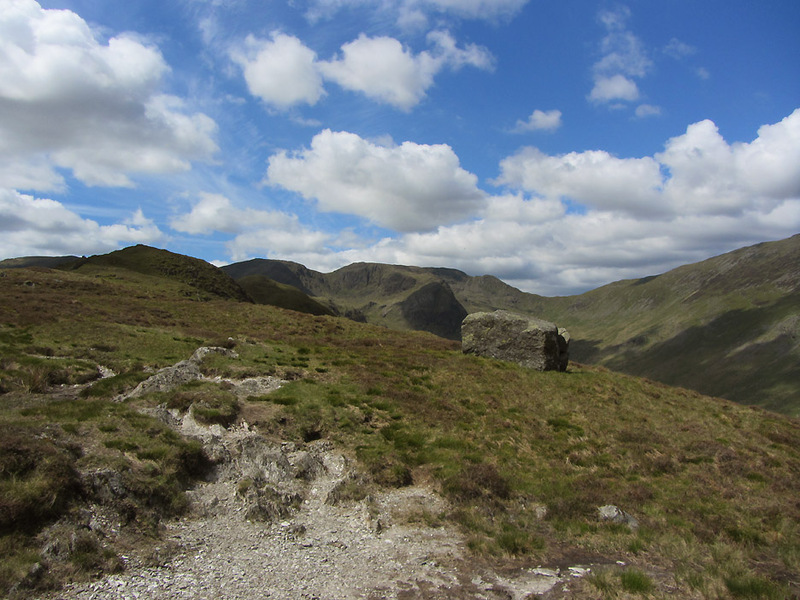 I just love the dappled sunshine on the fells all around . . . and the long distant views in this clear air. 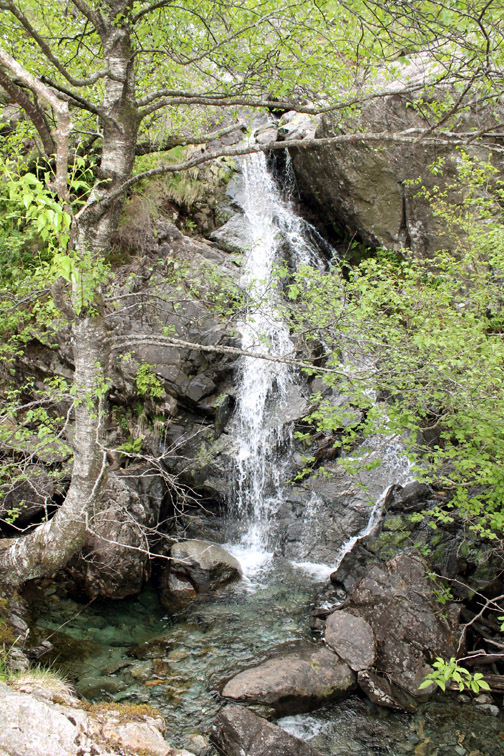 We hope to visit it on the way back down . 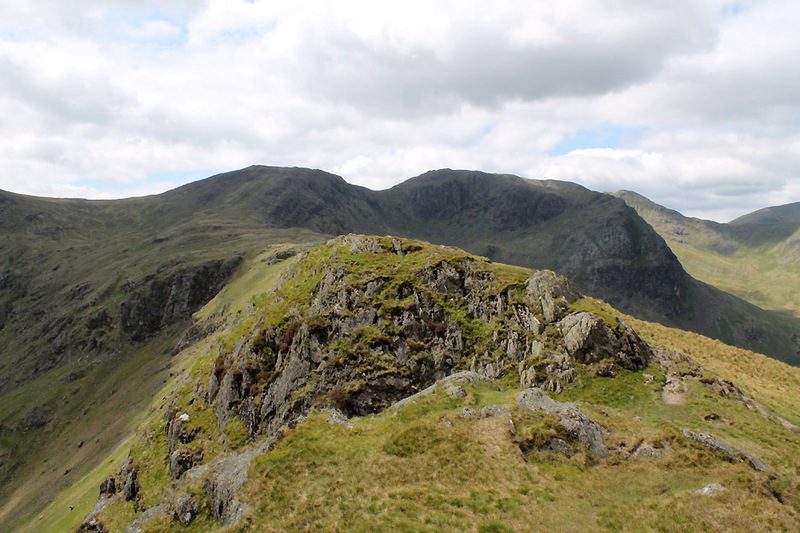 . . the summit above is Dove Crag of course.
" Onward and Upward "
Onward till you reach your goal . 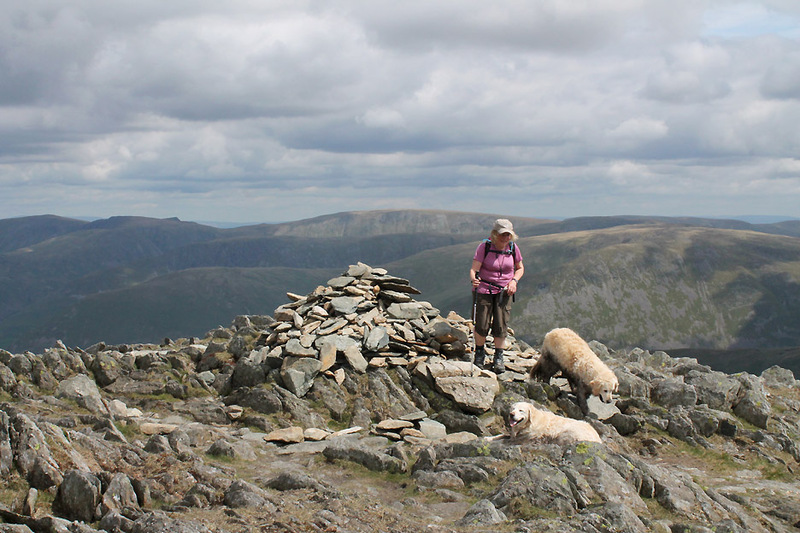 . . Hart Crag summit. 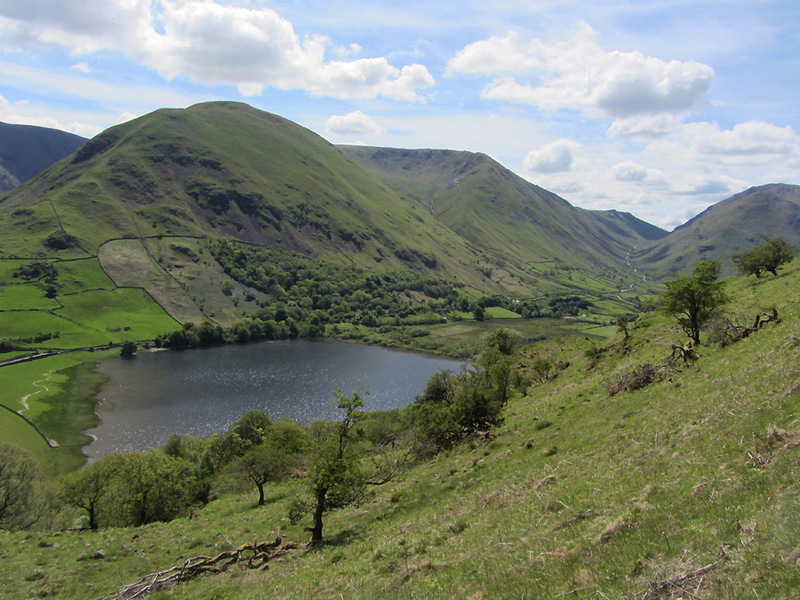 Click here or on the photo above for a Loweswatercam 360 degree annotated panorama from the top. A few more people about now we are on the "Fairfield Round " path. Time to stop hogging the summit . . . and find a place for a spot of lunch . . . with a view south this time. 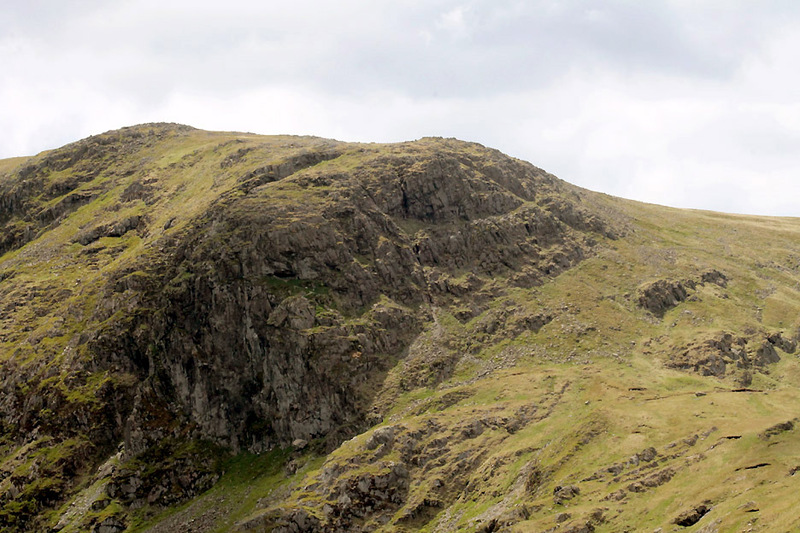 Our route back takes us towards the Crags of Dove Crag across to the right past the small cairn. 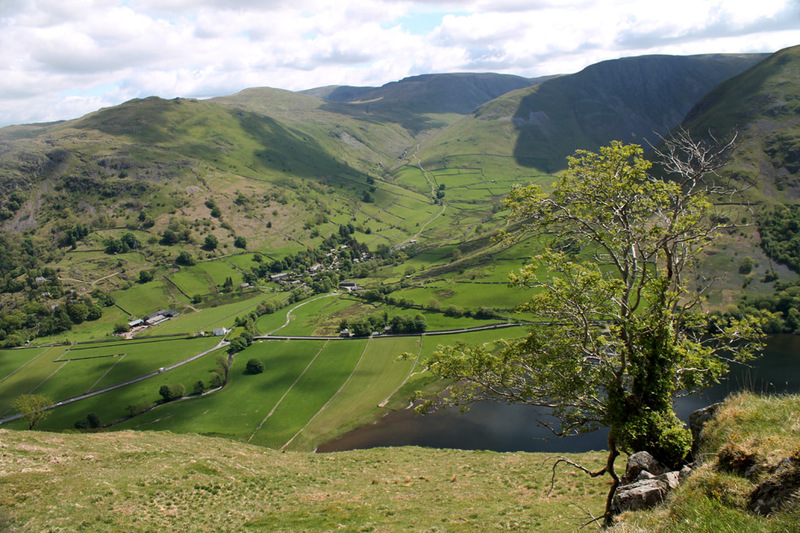 Hartsop above How that we climbed on the way up is now temporarily under the shadow of a passing cloud high above us. 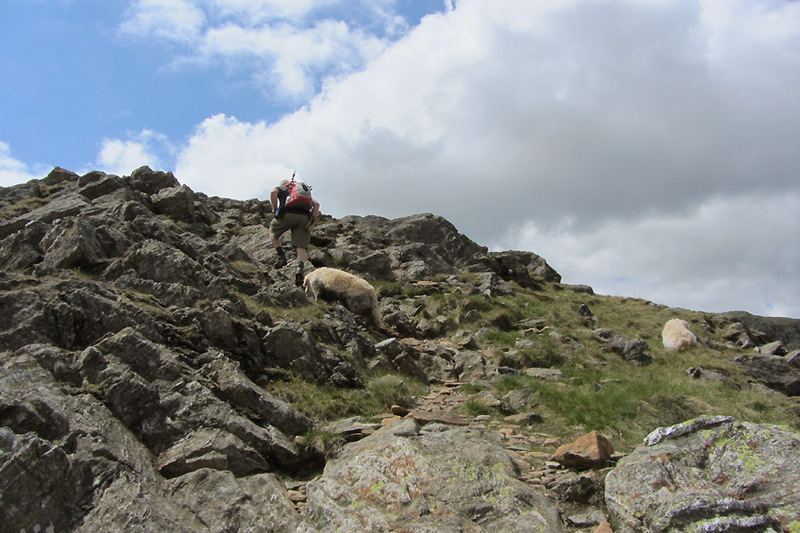 Taking a route alongside the break of slope . . .
. . . skirting the bottom of the steepest crags. 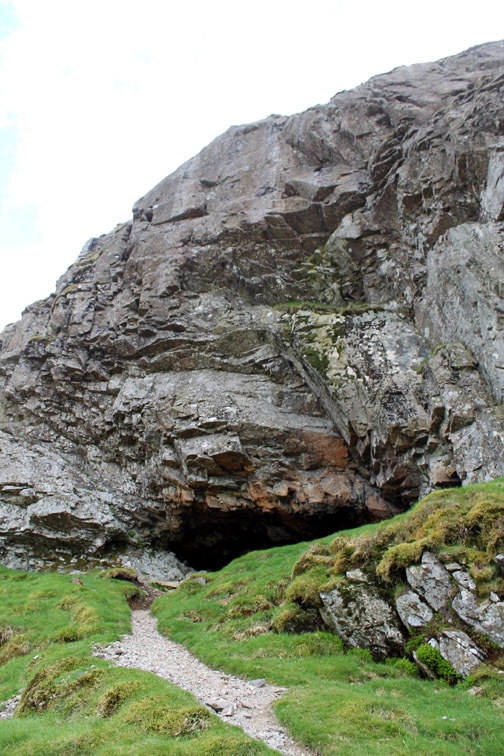 The faint path meets up with the track up to the cave. 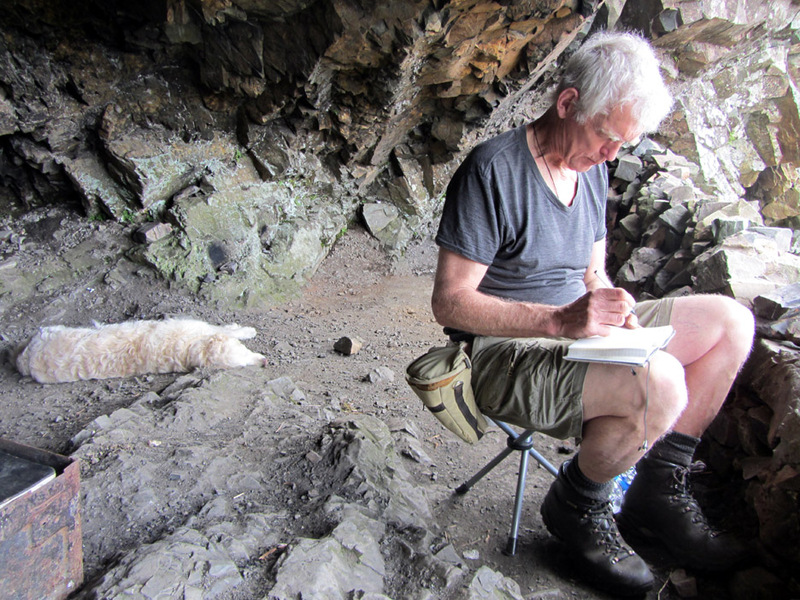 Ann find a seat in the darkness of the natural cave. 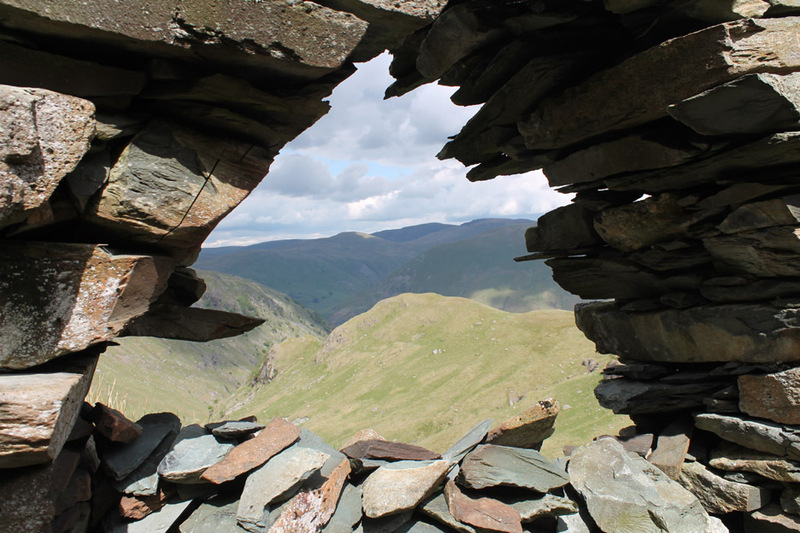 Situated high on the crags there's a fine view out when the weather is good . . . and fine shelter if it is not. 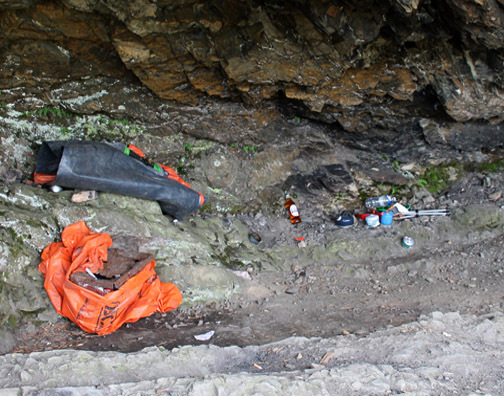 This cave is a well used bivvy spot for those that have time and equipment to stay overnight. There's no booking required . . . you take your chance about who you meet and sleep alongside. If you are lucky you'll have it to yourself, especially if you visit it away from a busy weekend. There's a bivvy box but also a little bit of rubbish ! 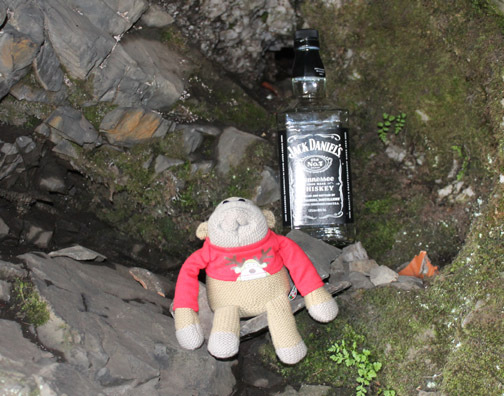 Unfortunately the troll had drunk all the goodies ! which I used when reading some of the entries and then writing our contribution to the Visitors Book. Bethan living on the edge . . . again. Time to make our way down the main approach track. 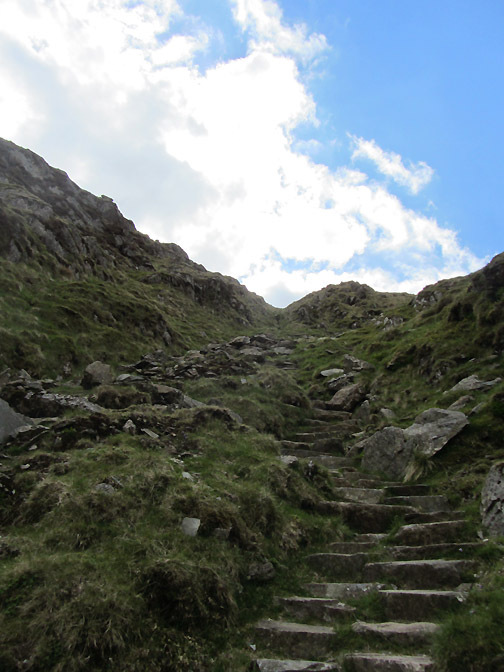 A well pitched path leads down into Dovedale. This sort of paving is really good . . . spot on ! It leads down past what I take to be an old quarry house. The view from the window is of . 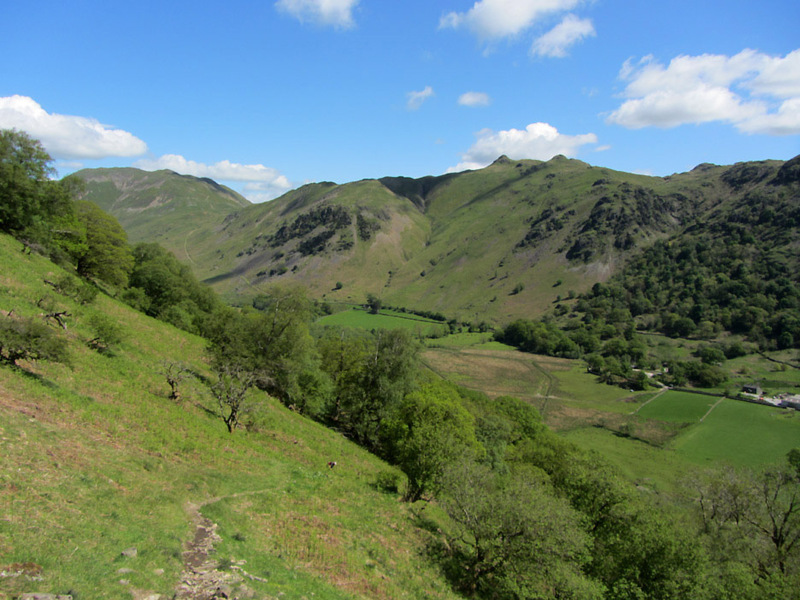 . . Brock Crags, Rest Dodd and High Raise beyond the Patterdale Valley. The sunshine covered fell in the foreground is the extension of Stangs. 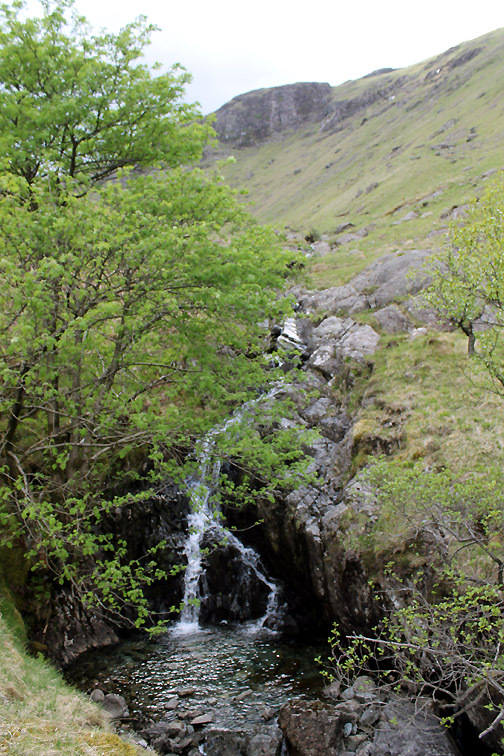 Dovedale Beck flows between it and us. 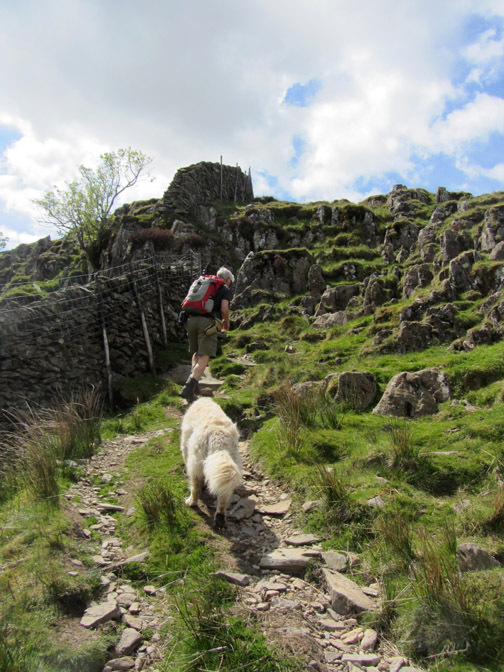 Safely down the pitched descent . . .
. . . we continue on down Dovedale. 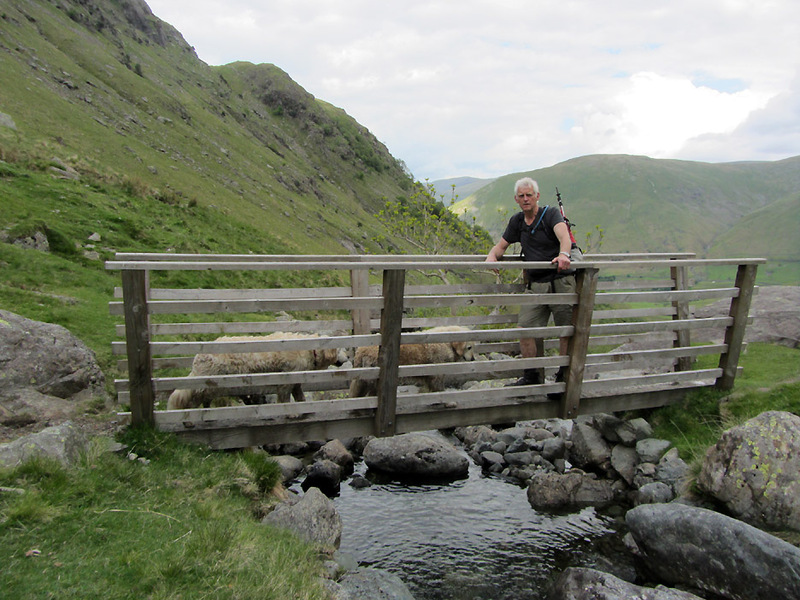 From humble beginnings, the beck now qualifies for a bridge to carry the path across to the other side. Descending close to the river . . .
. . . allows us to appreciate the waterfalls. 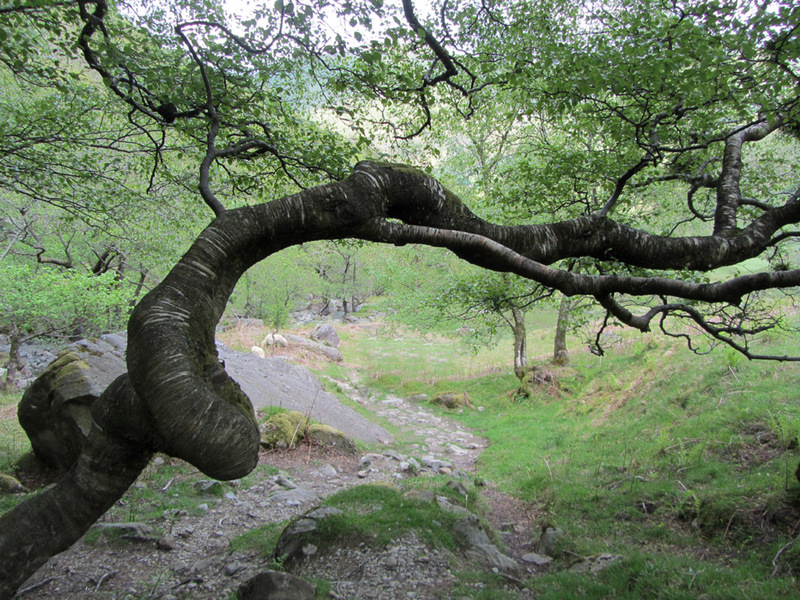 Friends reminded us to keep an eye out for this snake-like tree. 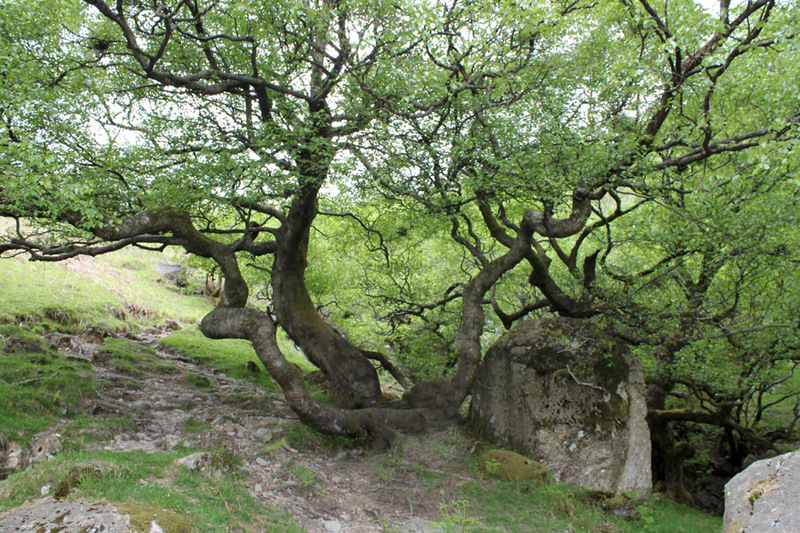 This medusa-like Beech has curled trunks growing in all directions. 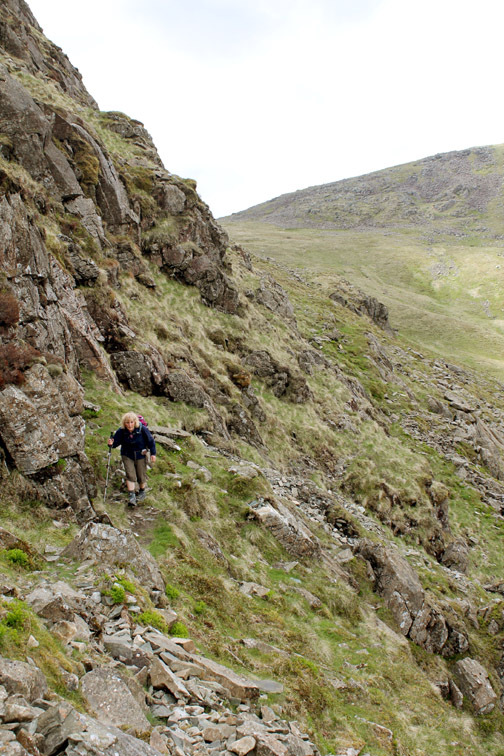 Nearing the flat ground at the bottom of the valley. 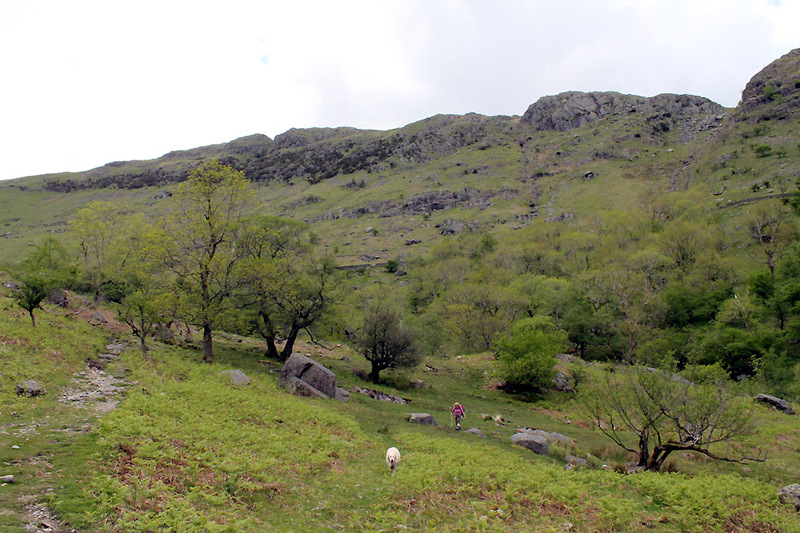 The rocks are more spaced out as the grass starts to gain advantage over the bracken. 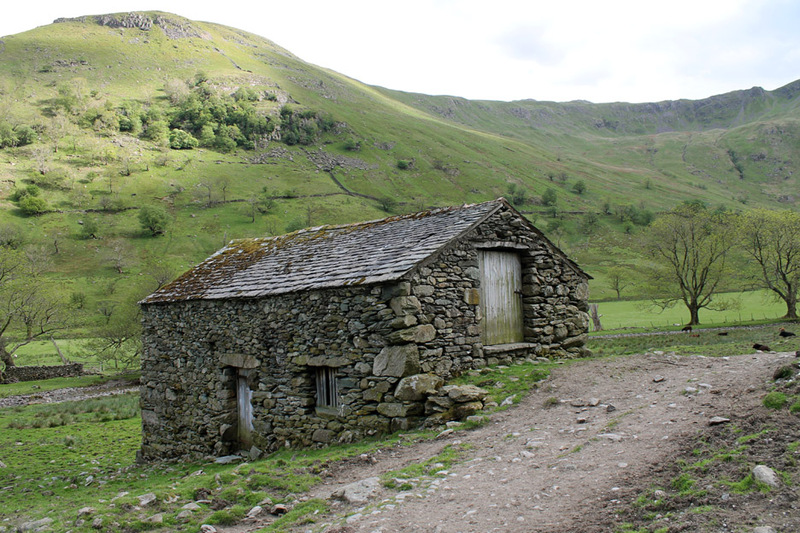 An ancient barn sits alongside the valley path . 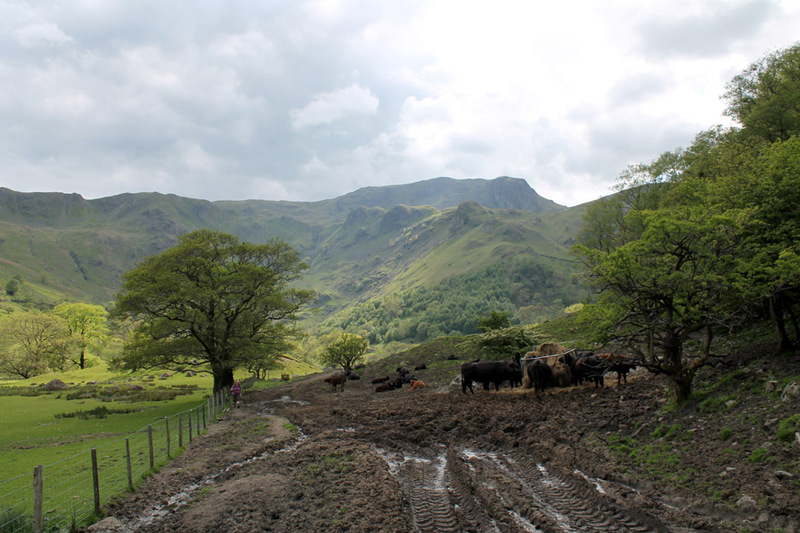 . . the track made wider over time, no doubt by the passage of farm animals. Not a route to be recommended in the wet ! Today there was an area by the fence that was dry . . . and the cattle were more interested in the feeder than us. 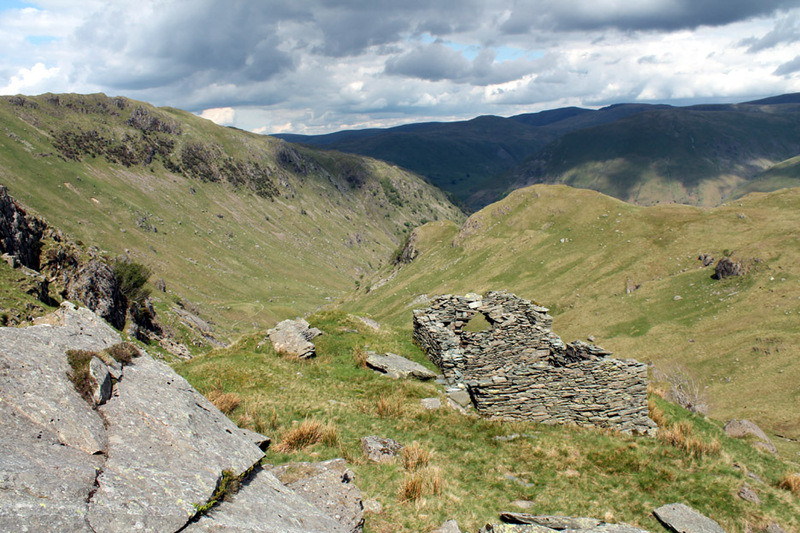 All that remains of the Hartsop Hall Lead Mine set on the fell side above the valley path. 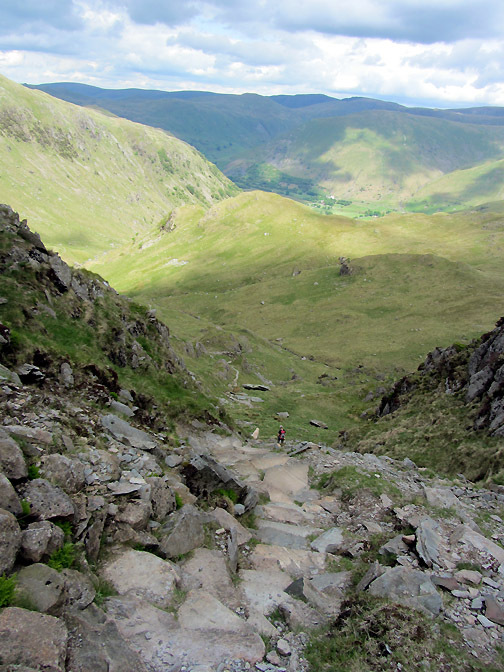 If you use the main path down the valley it passes more or less through the workings. 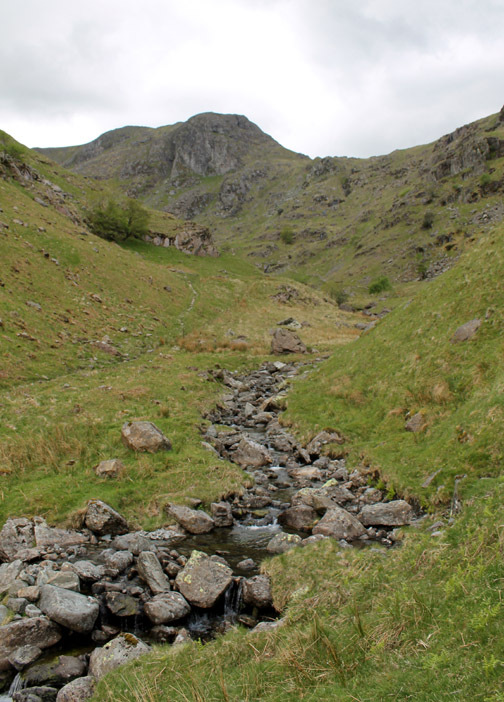 A water leat feeding water to the mine from the Dovedale Beck is still shown on the O.S. 1:25k map. 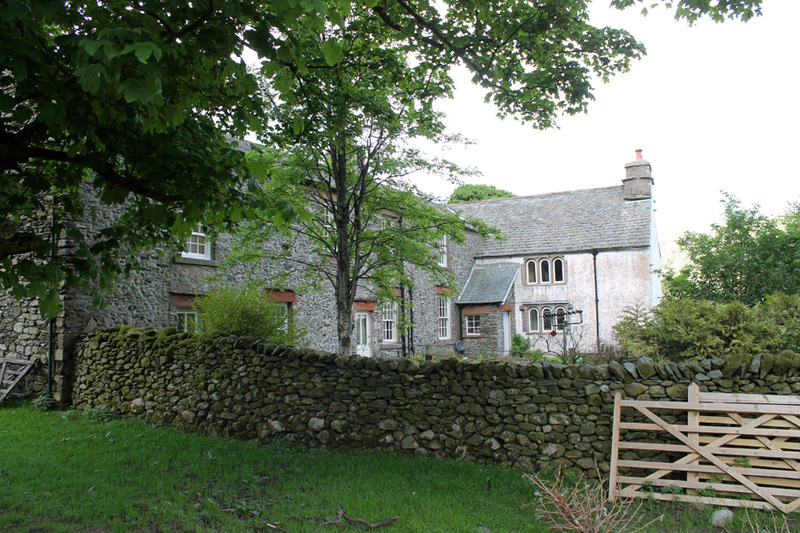 The ancient arched windows all round the oldest part of the building give a clue to its age. That's better . 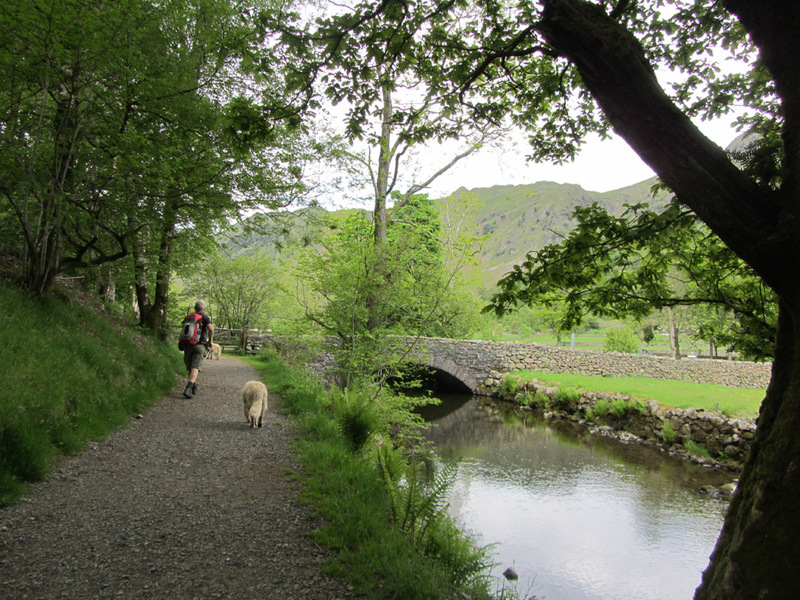 . . the sun's come out again for the last mile of our walk back to the car at Cow Bridge. 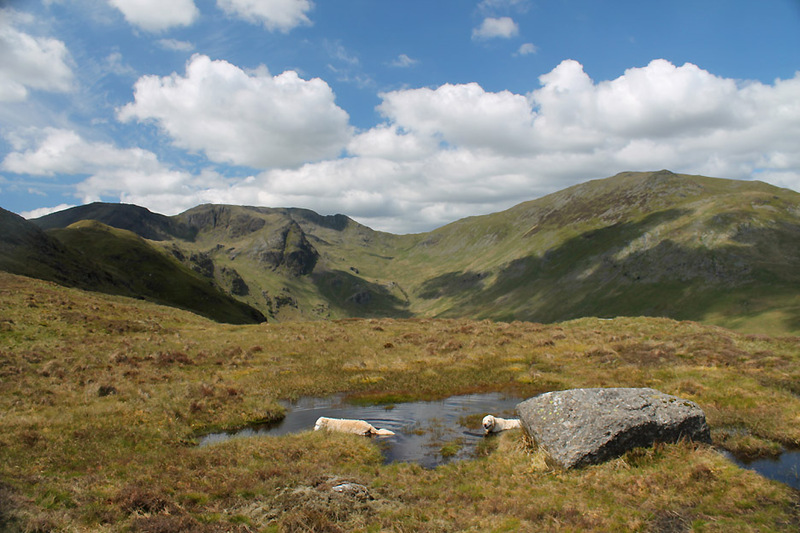 Ahead is Brother's Water and the dark twin peaks of Angle Tarn Pikes. 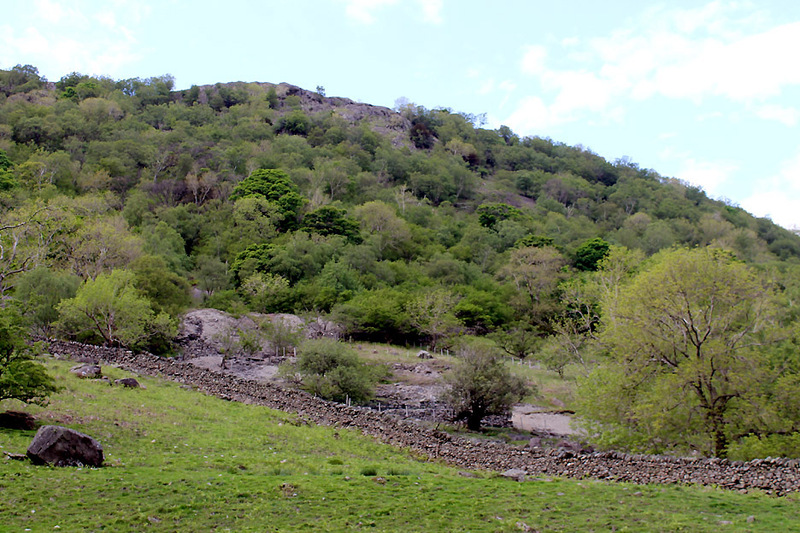 A blue sheen on the opposite fell tells us the bluebells here are still in bloom. taking the opportunity to dry his wings and warm up in the delightful afternoon sunshine. Quietly the lake gives way to the river. 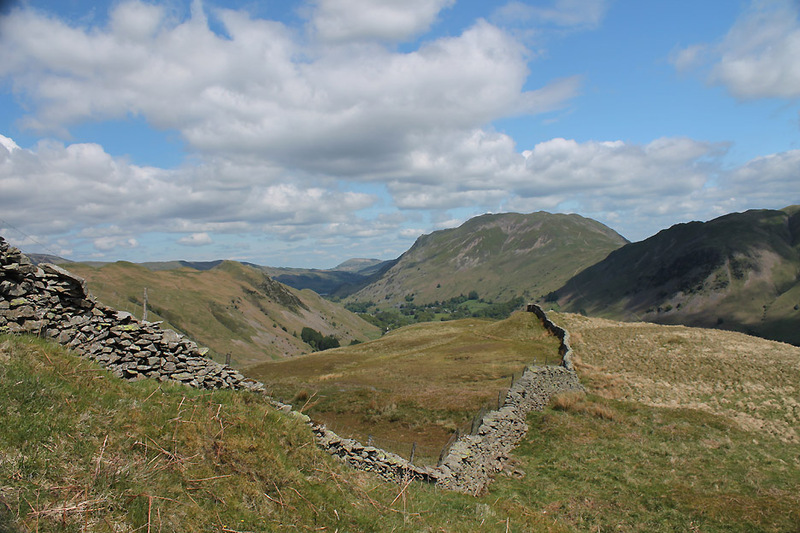 Full marks to anyone who knows that it goes by the name of Goldrill Beck between here and Ullswater. 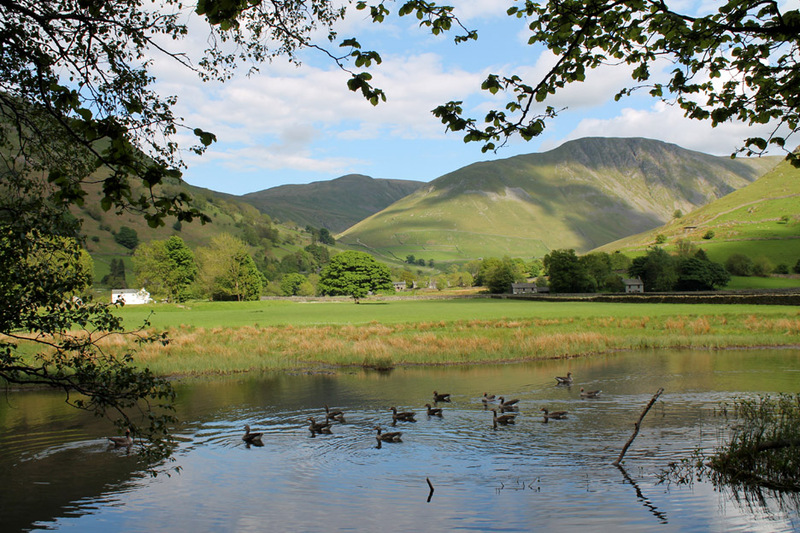 These geese are not too bothered . . . what's in a name ! 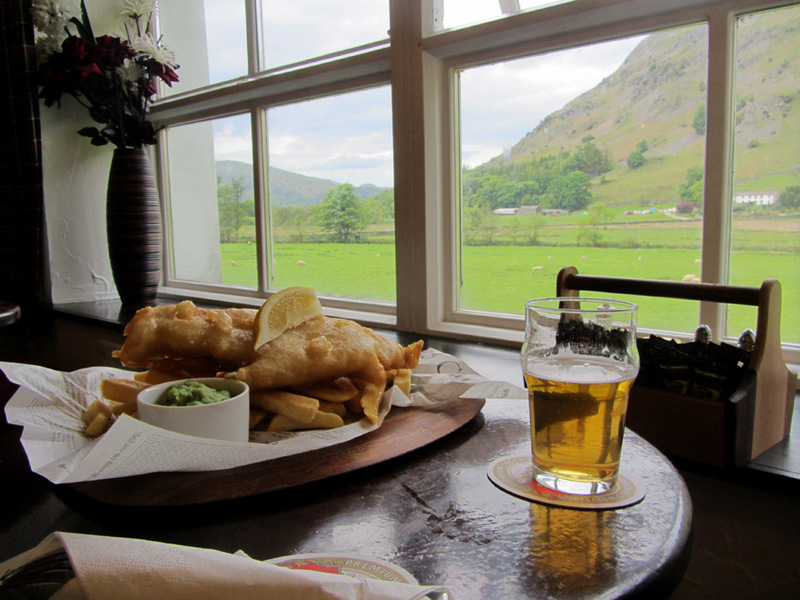 than a little re-hydration and a meal in a local tavern. only to find it came enclosed in newspaper ! Still the contents enclosed were as good as ever.
. . . and the view out of the window of the Goldrill Beck Valley wasn't bad either . . . cheers ! This site best viewed with . 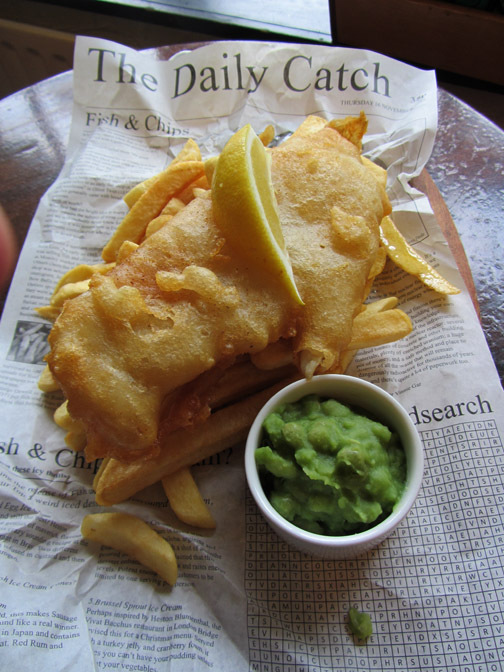 . . that familiar fish and chips at The White Lion on the way back.